A federal judge on Thursday sentenced a California chemical engineer to 15 years in prison and fined him $28 million after his rare economic-espionage conviction for selling China the technology that creates a white pigment. A jury previously convicted the 56-year-old Liew of receiving $28 million from companies controlled by the Chinese government in exchange for DuPont Co.’s secret recipe for making cars, paper and a long list of everyday items whiter. White noted that U.S. authorities had managed to trace $22 million of that money to various Singapore and Chinese companies controlled by Liew’s in-laws before losing the trail. Liew and his wife, Christina Liew, launched a small California company in the 1990s aimed at exploiting China’s desire to build a DuPont-like factory to manufacture the white pigment known as titanium dioxide. The Liews hired retired DuPont engineers and, according to the FBI, paid them thousands of dollars for sensitive company documents laying out a process to make the pigment. Two former DuPont engineers have also been convicted of economic espionage. A third engineer committed suicide in early 2012 on the day he was to sign a plea bargain acknowledging his role in the conspiracy. Except for a few months of release on bail, Liew has been in jail since his arrest in 2011. Wearing yellow jail garb and with his wife and family looking on from the gallery, Liew apologized. Liew’s wife has pleaded not guilty to obstruction of justice and other charges. In 2009, the Chinese government-controlled Pangang Group Co. awarded the Liews’ company a $17 million contract to build a factory that could produce 100,000 metric tons of the pigment a year. The same company had earlier awarded the Liews’ company millions more in similar contracts for smaller projects. Prosecutors allege that the operating Chinese factory was built with a detailed DuPont instruction manual stamped “confidential,” which earlier was used to build DuPont’s newest plant in Taiwan. Robert Maegerle, a retired DuPont engineer, was convicted of economic-espionage charges along with Walter Liew in March. They are the first people to be convicted of economic espionage by a jury since Congress passed the Economic Espionage Act in 1996, according to the U.S. Department of Justice. 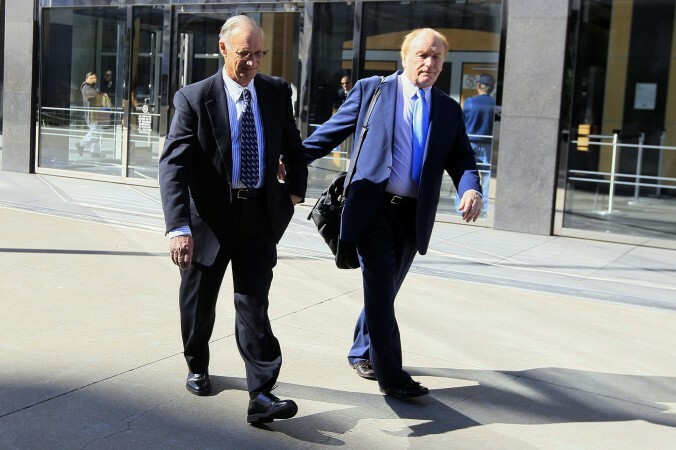 About 20 other defendants have pleaded guilty to economic espionage charges before trial. Federal officials say foreign governments’ theft of U.S. technology is one of the biggest threats to the country’s economy and national security. “The battle against economic espionage has become one of the FBI’s main fronts in its efforts to protect U.S. national security in the 21st century,” said David Johnson, the FBI’s special agent in charge of the San Francisco office. Maegerle, 78, is to be sentenced later and remains free on bail.